Making a stir fry is a fun and exciting culinary experience with a certain exotic flare. 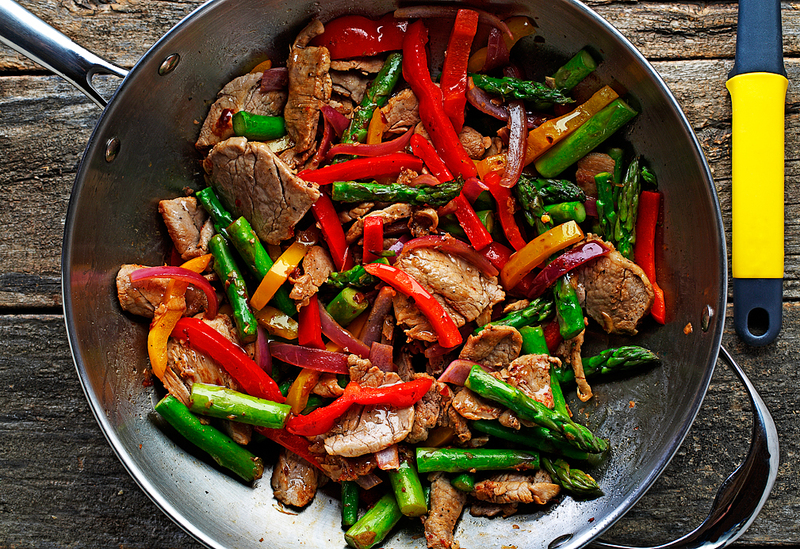 Here, I use a combination of asparagus, onions and bell peppers to add crunch and nutritional value to the dish, and recommend pork tenderloin to satisfy the meat eaters. For a proper stir fry, you need three things: a wok, great flavor and high heat. Canola oil has a high smoke point and neutral flavor so the rest of the ingredients can really shine. Best way to serve a stir fry? 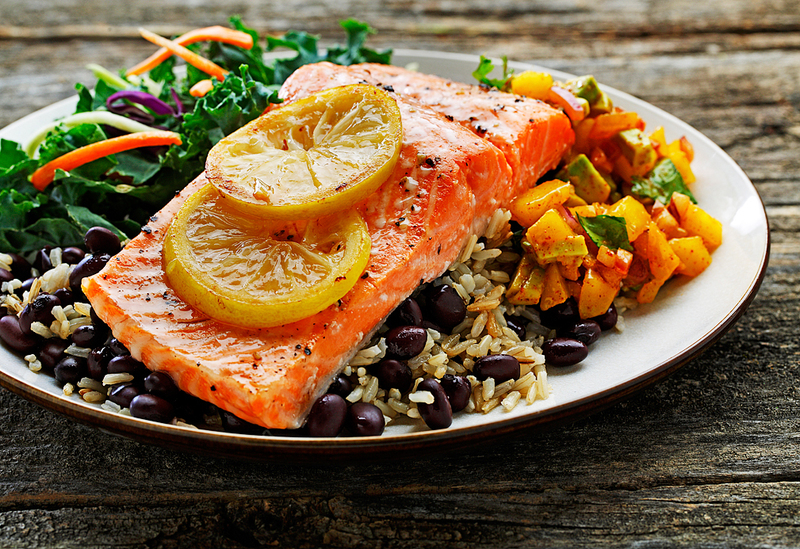 Try pairing it with whole grains, like brown rice or quinoa. 1. Heat a large wok at medium high heat. Add 1 Tbsp (15 mL) of canola oil and let it heat up for one minute. Add pork, salt and pepper. Cook for 2-3 minutes. Remove pork from wok and set aside. 2. With same wok, add the remaining 1 Tbsp (15 mL) canola oil and heat for 1 minute. Add onion, peppers, and asparagus. Cook for 2 minutes. 3. Add chili, vinegar, and garlic. Stir around for 3 minutes. 4. Add pork back into the wok and cook for 1 minute. Remove from the heat. The summer season is here! Time to light up the flames under some mean, tasty food. 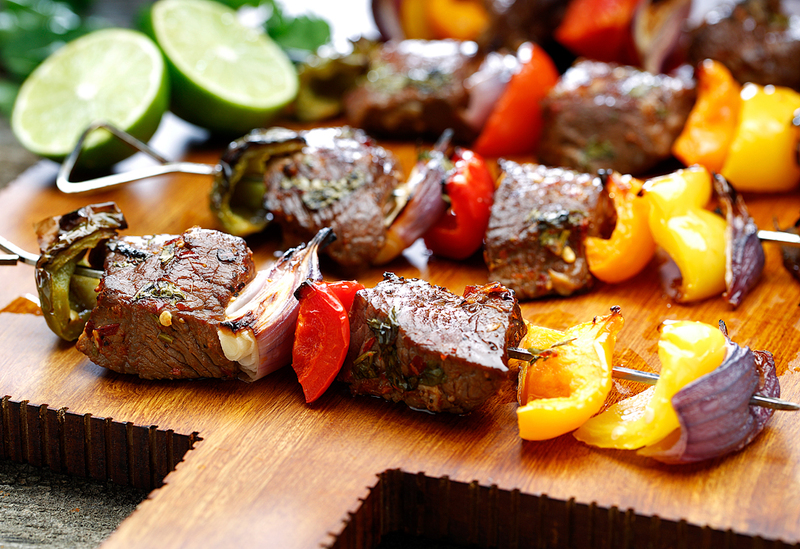 Of course, no summer get-together is complete without some skewers thrown on to a grill. For this dish, I recommend using lean, top sirloin steak cuts for a healthier red meat option, mixed up with some colorful vegetables. The marinade fuses the Latin flavors of aji, cilantro and lime with the Asian flavors of the soy sauce. The low saturated fat content of canola oil allows the marinade to stay free-flowing in the refrigerator. Frittatas are a great meal option because they can be served for breakfast, lunch, or dinner. 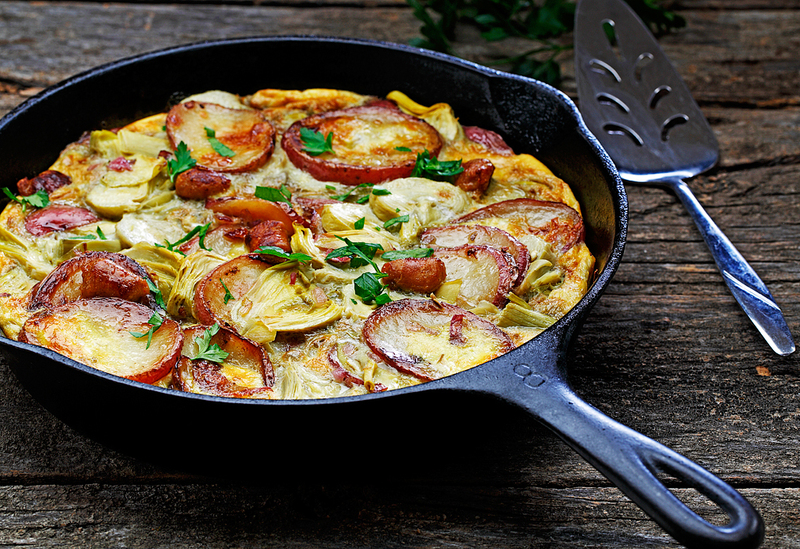 Using hearty ingredients, like potatoes and artichokes, add a boost of flavor and extra nutrition. Canola oil’s high heat tolerance allows me to go seamlessly from the stove top to the oven. This is a basic recipe for roasting fish – quick, easy, and simple. The salsa is made with canola oil because its neutral taste doesn’t overpower the natural flavors of the mango. You can also use the salsa as a dip or to add extra flair to other entrees. This dish tastes fantastic served with black beans or brown rice. 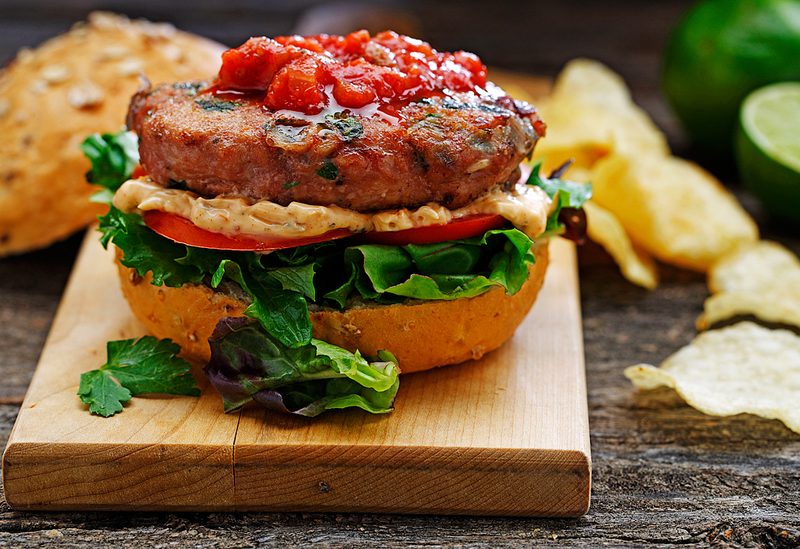 This chicken patty, seasoned with parsley, garlic and onions, is perfect for summer time. Cooking with canola oil allows the great flavors of the herbs to stay intact, while resisting the high heat of the sauté pan and the grill. Enjoy as a burger, on top of a salad or paired with rice and beans. Rainy outside? Not a problem. You can use a griddle or frying pan for easy and efficient indoor cooking. Wow your friends and family at your next potluck or gathering with this meatless main that also works as a great side dish. 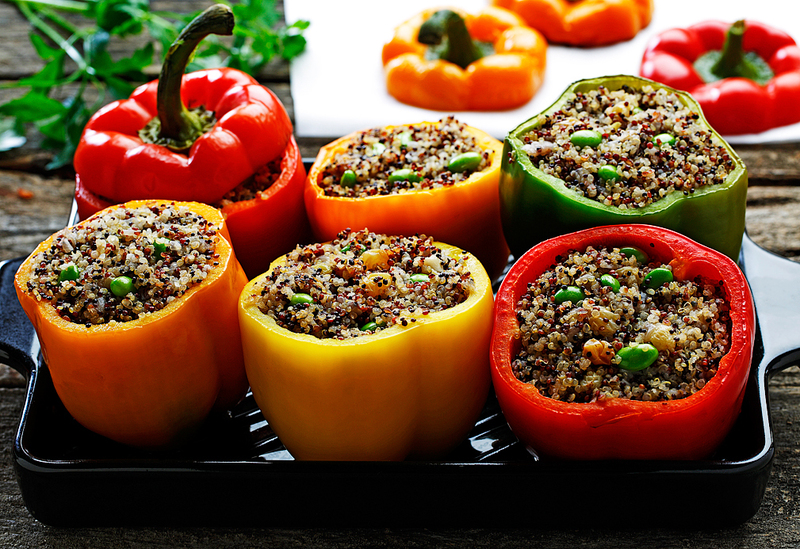 Using tricolor quinoa and tricolor bell peppers provides a rainbow on your plate. Heart-healthy canola oil boosts the nutritional value in this recipe, having the least saturated fat and most plant-based omega-3 fat of the common cooking oils while adding vitamins E and K.